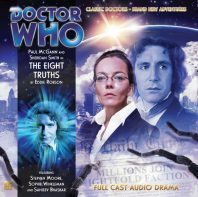 The eclectic third series of The Eighth Doctor Adventures begins to draw to a close with Eddie Robson’s ‘The Eight Truths,’ the first half of what is becoming a staple two-part finale and a story that unsurprisingly looks to Doctor Who’s past once more to progress the continuing adventures of the Doctor and Lucie Miller. In 2015 London while the Doctor is searching for a lost space probe, Lucie stumbles upon an old acquaintance that leads her to The Eightfold Truth and the promise of finding her true self through the use of energy crystals as its members prophesise that a rebel sun will soon come upon Earth to purge the planet of all but its own group’s devout followers. The last Robson-penned two-parter for this range was the superb ‘Human Resources’ which deftly combined the monotony of an office day job with the fantastically imaginative opportunities that Doctor Who allows. To some extent, that same blending of notions is present here, though the more grounded focus is instead on life within what amounts to a cult and the beliefs that stem from it. Indeed, in a world so beleaguered by issues big and small, it’s easy to see why individuals would cling to any group offering them hope, knowledge, and peace, and this notion forms a powerful anchor as events continue to grow in scale and beyond the limits of just Earth. Unfortunately, the appearance of the Eight Legs first seen in Jon Pertwee’s farewell story ‘Planet of the Spiders’ at the end is anything but a surprise. The presence of strange crystals purported to heal and affect the mind is a nice callback to that original serial that works quite well, but ‘The Eight Truths’ on several occasions almost goes out of its way to directly suggest that those creatures are returning, the cover art even showing several spider legs. Much like a story with Daleks or some other foe in the title, using the entire first half as exposition for their true appearance is an understandable choice structurally but an odd one in terms of how much time is allowed to further explore these little-seen beings. Still, that is a concern that the upcoming ‘Worldwide Web’ will hopefully assuage. Truly, the second half has a tall task before it because the setup work done in ‘The Eight Truths’ is exceedingly well done. Though it’s strange to see the Doctor in more of a background role as he furtively searches for the missing probe and tries to piece disparate fragments of information together, it’s also strangely refreshing to note just how much the plot progresses when he is forced into a coma for twenty-three days to repair himself after an attempted bombing. Without question, the re-emergence first of the Headhunter with Karen and then of the stellar manipulator which ominously hangs as a second sun in Earth’s orbit is a strong convergence of characters and events befitting of the most lavish television finales and provides a strong sense of coherency and consequence to what has come before in this range. However, it’s Lucie herself who once more takes prominence as she finds herself brainwashed into believing the Doctor is her enemy before quickly assuming an authoritative position within the cult. ‘The Eight Truths’ is certainly not flawless, but it easily captures the imagination and attention of its audience while setting the scene for what promises to be a robust concluding half. Though the majority of the cult members themselves blend together into one and the sparkling dynamic between the Doctor and Lucie is noticeably missing due to distance and mind control, the deft direction and sound design allow the atmospheric script to effortlessly unfold while managing to in some cases evoke the spirit of its 1974 predecessor, a strong compliment for a tale tasked with continuing the modern resurgence of the franchise.